CA county law libraries are a free community resource whose existence is mandated by the state legislature. Unlike other public libraries, we focus on legal materials and our librarians are specialists in legal information. Our mission is to facilitate access to justice for all members of the community by providing the tools needed to help citizens educate themselves about the law, complete legal forms, and prepare for court. We also differ from other public libraries in that we receive NO TAX DOLLARS. 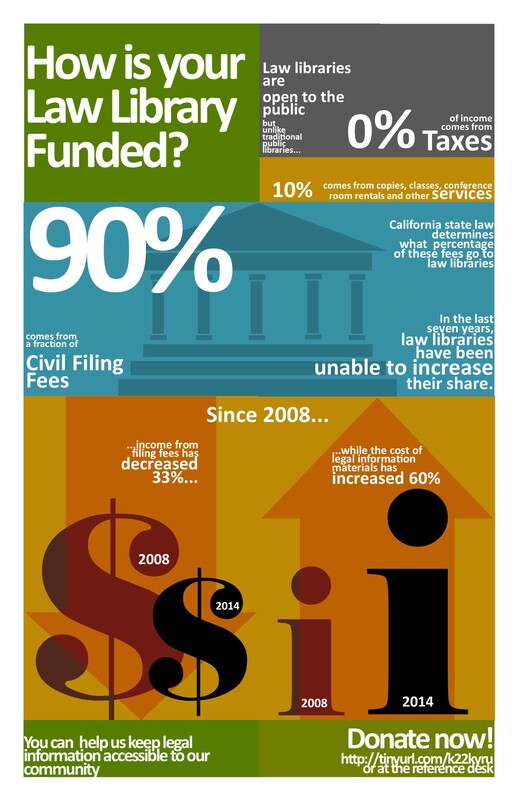 Our income is based almost entirely upon a fraction of civil filing fees collected by the court. This income has decreased 40% over the past few years, even as the cost of legal materials has increased 60%. In the last few years, law libraries have been forced to manage expenses by reducing resources and staff, seriously undercutting our mission. If not addressed soon, the issue of funding will cause services to dwindle further, and some libraries will be forced to close. Please help us communicate the urgency of our situation to the state legislature by adding your name to a petition that will be delivered to CA State Senator Loni Hancock. Senator Hancock represents many Alameda County communities and is a member of the CA State Senate’s Standing Committee on Budget and Fiscal Review. The petition can be signed using this link. Thank you for taking a few moments to help the Alameda County Law Library, as well as other county law libraries around the state, get the adequate funding needed to continue with our mission of providing free legal information and access to justice for all CA citizens. A multi-type library association, BayNet welcomes librarians and information professionals from all varieties of organizations in the San Francisco Bay Area. Our mission is to strengthen connections among all types of libraries and information centers, and to promote communication, professional development, cooperation, and innovative resource sharing. Come join us by becoming a member.